JEZREEL ( , "God sows"). 2. A city of Issachar, mentioned with Chesulloth and Shunem (Josh. xix. 18). Owing to its importance, Jezreel gave its name to the whole district which was subsequently included in the kingdom of Ish-bosheth (II Sam. ii. 8). But Jezreel acquired its greatest fame in the reign of Ahab, who chose it for his residence (I Kings xviii. 45). Ahab had a palace there (ib. xxi. 1). The harem was near the gate, forming a part of the city wall (II Kings ix. 30, 33). Close by was a watch-tower, which perhaps also formed a part of the royal building (ib. ix. 17). It may be that Ahab's ivory palace (I Kings xxii. 39) and Jezebel's establishment for idolatrous priests (ib. xvi. 33, xviii. 39; II Kings x. 11) were also at Jezreel.Close to Ahab's palace was the vineyard of Naboth the Jezreelite, so much coveted by Ahab (I Kings xxi. 1 et seq.). It would seem, from a comparison of I Kings xxi. 19 and xxii. 38, that the assassination of Naboth took place at Samaria. But with reference to the latter passage Josephus ("Ant." viii. 15, § 6) says that Ahab's chariot was washed in the fountain of Jezreel. Besides, a confusion between Samaria and Jezreel is seen in I Kings xxi. 18 and II Kings x. 1. In front of Ahab's palace was an open space where dogs roamed. It was there that they devoured Jezebel's body (II Kings ix. 35-37).Jezreel was also the residence of Joram, son of Ahab (ib. viii. 29, ix. 15); there he met his death at the hands of Jehu (ib. ix. 24, 25). The heads of Ahab's seventy sons were sent by command of Jehu from Samaria to Jezreel, by the gateway of which city they were piled till the following morning (ib. x. 7, 8). 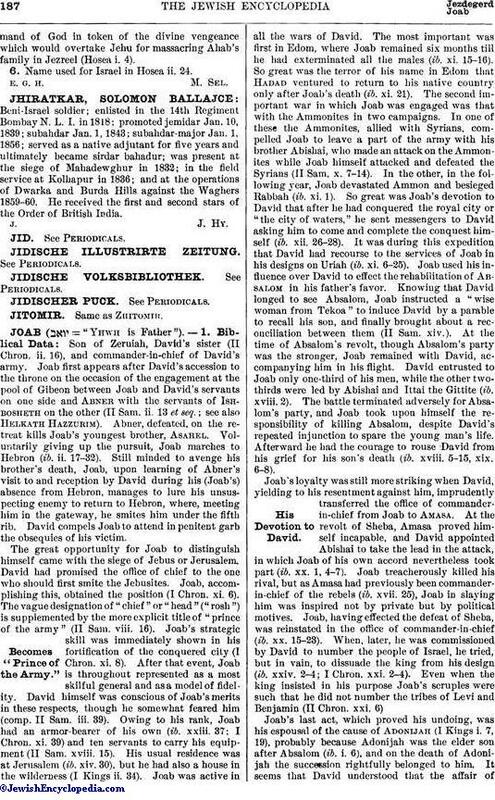 Jezreel was also the scene of the massacre of Ahab's family and of all who were suspected of sympathy with his dynasty (ib. x. 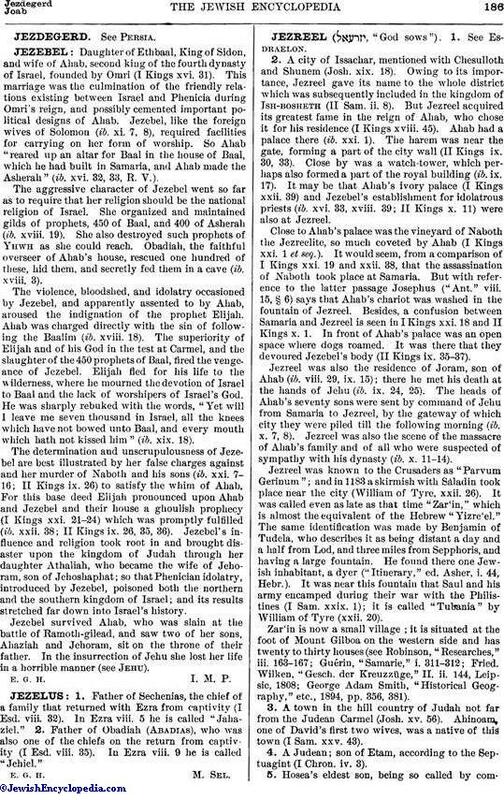 11-14).Jezreel was known to the Crusaders as "Parvum Gerinum"; and in 1183 a skirmish with Saladin took place near the city (William of Tyre, xxii. 26). It was called even as late as that time "Zar'in," which is almost the equivalent of the Hebrew "Yizre'el." The same identification was made by Benjamin of Tudela, who describes it as being distant a day and a half from Lod, and three miles from Sepphoris, and having a large fountain. He found there one Jewish inhabitant, a dyer ("Itinerary," ed. Asher, i. 44, Hebr.). It was near this fountain that Saul and his army encamped during their war with the Philistines (I Sam. xxix. 1); it is called "Tubania" by William of Tyre (xxii. 20).Zar'in is now a small village; it is situated at the foot of Mount Gilboa on the western side and has twenty to thirty houses (see Robinson, "Researches," iii. 163-167; Guérin, "Samarie," i. 311-312; Fried. Wilken, "Gesch. der Kreuzzüge," II. ii. 144, Leipsic, 1808; George Adam Smith, "Historical Geography," etc., 1894, pp. 356, 381). 3. A town in the hill country of Judah not far from the Judean Carmel (Josh. xv. 56). Ahinoam one of David's first two wives, was a native of this town (I Sam. xxv. 43). 4. A Judean; son of Etam, according to the Septuagint (I Chron. iv. 3). 5. Hosea's eldest son, being so called by commandof God in token of the divine vengeance which would overtake Jehu for massacring Ahab's family in Jezreel (Hosea i. 4). 6. Name used for Israel in Hosea ii. 24.